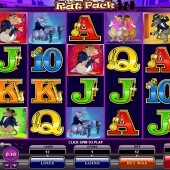 Rock-steady, reliably cool, and producing a dependable string of hits – that was the strategy of the original Rat Pack stars of the 1950s, and it’s certainly a strategy that another smooth outfit, online slot developer Microgaming, have followed over the years. The Rat Pack is another reliable addition to this developer’s burgeoning catalogue, and if you loved the Las Vegas of Frank Sinatra, Dean Martin and Sammy Davis, Jr, you’ll enjoy this. A 5 reel, 30 pay-line slot, the graphics are hardly worthy of the Vegas Strip – they mostly consist of the 10 to Ace card values and cartoon rats in various crooner poses – but the Wilds are of interest. Interestingly, there are two Wilds – the Rat Pack symbol and the 2x Multiplier symbol. Every time a Rat Pack symbol hits a pay-line it will substitute for all the other symbols (except the Scatter) in the usual way. When used as substitute in a winning combination, this Wild can get you anywhere from 75 to 5,000 coins. However, the 2x symbol doubles your payouts on all the winning combinations it creates. The red, green or orange rats all pay 1,000 coins for a Five of a Kind. 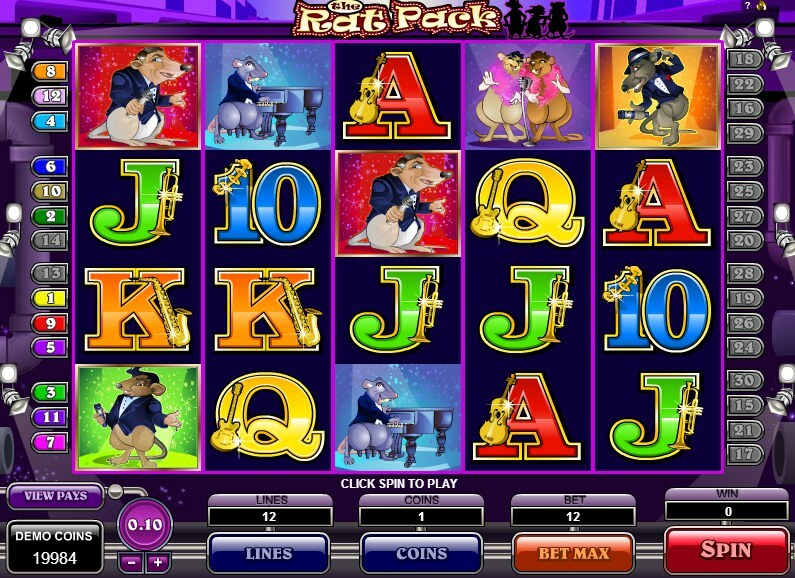 The Free Spins Bonus game in The Rat Pack is triggered by hitting at least three Gold Record Scatter symbols. Featuring an interesting ‘nudge’ element, the Gold Record symbol remains in place for the duration of a spin, with all the other reels spinning in a normal manner. After the spin is completed, the reels that have the Gold Record on them are moved one position downwards, and if the disc is still on it, the reels stay in place again. The free spins feature only ends when there aren't any more Gold Record symbols to be seen, and the total added to your winnings. Those of you after a more sophisticated take on the Vegas of old should probably tackle online casino software developer IGT's Elvis-related slot Elvis: A Little More Action and fellow Elvis themed slot Elvis Multi-Strike, but if you love lounging it with a soothing jazz track – and cartoon rats, of course - this is the slot for you.